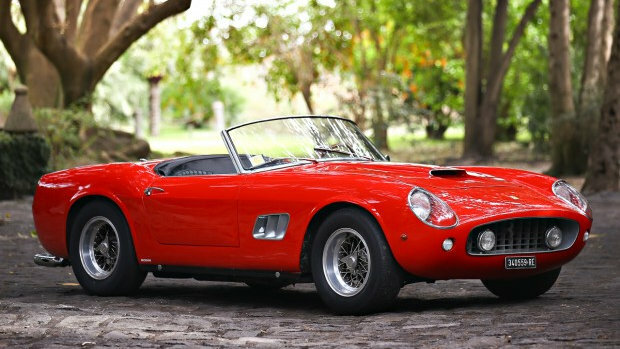 A 1961 Ferrari 250 GT SWB California Spider and Jerry Seinfeld’s Porsche collection are highlights of the 2016 Gooding Amelia Island classic car auction. While the 1961 Ferrari 250 GT SWB California Spider (estimate $15,000,000 – $17,000,000) is expected to achieve the highest result, 14 of the Porsches on offer are estimated to sell for more than a million dollar. Other cars expecting to sell for more than a million dollar include three further Ferraris, a Ford GT40, a Duesenberg Model J and a Shelby Cobra 289. Gooding & Company’s annual Amelia Island classic car auction is on March 11, 2016 at the Omni Amelia Island Plantation in Florida, USA. If the 1961 Ferrari 250 GT SWB California Spider (estimate $15,000,000 – $17,000,000) sells, it is like to more than double the current Amelia Island record of $6,600,000 paid for the fabulously elegant 1937 Delahaye 135 Competition Court Torpedo Roadster at the RM Amelia Island 2014 auction. A 1961 Ferrari 250 GT SWB California Spider, chassis 2871, (estimate $15,000,000 – $17,000,000) is likely to be the most-expensive car sold at the 2016 Amelia Island series of classic car auctions. The Ferrari 250 GT California Spider is the most-expensive model series in the classic car world. 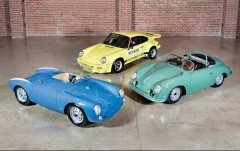 Of the 29 cars that have ever sold at public auction for more than $10 million, five were California Spiders. A 1961 Ferrari 250 GT California Spider was the first car ever to have sold for more than $10 million (at RM Auctions Maranello 2008 sale). The 1961 Ferrari 250 GT SWB California Spider, chassis 2871, on offer at Amelia Island 2016 is a very fine example. Ferrari produced only 106 California Spiders of this era – 50 LWB and 56 SWB. This car is one of only 37 of the short-wheelbase versions that coachbuilder Scaglietti made with covered headlights. This 1961 Ferrari 250 GT SWB California Spider had only three Italian owners with the vendor not having shown the car at public events since acquiring it in 1985. The car appeared briefly in Vittorio De Sica’s Academy Award®-winning feature film, Yesterday, Today, Tomorrow, when Sophia Loren hitched a lift after crashing her Rolls Royce. This 1961 Ferrari 250 GT SWB California Spider is in a largely unrestored but well-maintained condition. Even at upper estimate, it should be reasonably priced compared to the model world record holder – the barn-find Baillon Ferrari 250 GT California Spider that Artcurial sold for $18,649,760 in Paris 2015. Gooding traditionally has done well with Porsche cars at Amelia Island and 2016 will be no exception. A fine selection of 29 Porsches will be on offer of which half is likely to sell for more than a million. See 2016 Gooding Amelia Island Sale (Seinfeld Porsches Preview) for more on these cars from Jerry Seinfeld’s car collection. The 1968 Porsche 908 Coupe (estimate $3,000,000 – $3,300,000) is thought to be one of only five surviving factory 908 Coupes. Porsche raced this car only three times with a best result third at the 1968 Spa 1000 Kilometer. The car was often displayed in recent years including Amelia Island Concours d’Elegance, March 2015 (Most Outstanding Porsche Race Car). The 1988 Porsche 959 Komfort (estimate $1,300,000 – $1,600,000) is one of 242 Komfort models built. Its four owners drove only 18,000 miles in this supercar. In 2015, five Porsche 959s sold for more than a million dollar but neither of the two offered thus far in 2016 found buyers. The 1970 Porsche 911 2.3 ST (estimate $1,100,000 – $1,400,000) is one of only seven works cars built in 1970 for official rally use. The car was driven to victory on its debut race – 1970 Austrian Alps Rally – by Waldegård and Helmer. In 1971, it achieved several victories including first overall at the 1000 Km de Paris. The 1966 Ford GT40 Mk1 (estimate $3,200,000 – $3,600,000) is one of only 31 original road coupes produced. It was originally used by Ford for dealer promotions and is finished in the correct light blue (but sans orange racing stripe). The Ford has covered just 3,200 miles since new. The 1931 Duesenberg Model J Disappearing-Top Convertible Coupe (estimate $2,500,000 – $3,000,000) is one of around 500 Model Js built. It has covered just over 30,000 miles since new with previous owners preferring to keep it well maintained rather than restore it for the show circuit. This Duesenberg sold for $2.2 million at the RM Auctions Arizona 2014 sale. The 1964 Shelby Cobra 289 (estimate $950,000 – $1,100,000) has an extensive period SCCA race history and is offered with a Le Mans hardtop and a spare engine. The car was restored by Canepa and shown at the 2012 Amelia Island Concours d’Elegance (Second in Class). RM Sotheby’s will also offer a 289 Cobra at Amelia Island 2016. The 1995 Ferrari F50 (estimate $2,400,000 – $2,800,000) is one of only 55 built to US specification. It has covered only 5,500 miles from new. Gooding sold an F50 for a model record $2.4 million at Scottsdale 2016. The 1963 Ferrari 250 GT Lusso (estimate $1,900,000 – $2,400,000) is offered for sale by only its second owner, who had driven the car sparingly in the past five decades. The car is in a largely original condition and received only a minor cosmetic restoration during the early 1990s. Only around 200 of the 1960 Ferrari 250 GT Series II Cabriolet (estimate $1,500,000 – $1,800,00) were built but four of these have already been offered at public auction thus far in 2016. Only one has sold – for $1.65 at RM Sotheby’s Arizona 2016. The Ferrari on offer at Amelia Island was only the fourth car built and the car used to introduce the model to the public at the 1960 Geneva Motor Show.